Three charts help explain that last year was the worst year since 2008 for diversified portfolios, but also how the trend is shifting for 2019. What a difference a quarter can make. At the end of the third quarter, a handful of U.S. stocks were doing better than the rest of the market, and U.S. stocks were easily outperforming both non-U.S. developed and emerging markets. Fixed-income allocations provided little stability for investors, and risk allocation portfolios were doing even worse. In the fourth quarter of 2018, each of these observations reversed. The return of variation in return among asset classes (even in a generally negative environment) is encouraging for multi-asset investors. 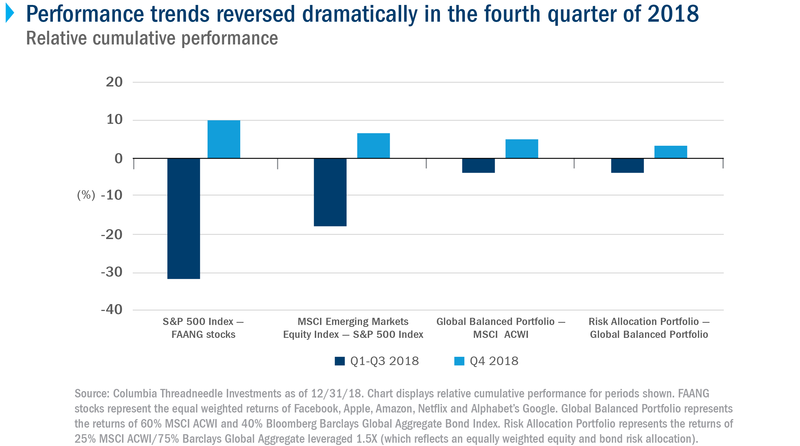 Going into the end of the third quarter, a global, balanced approach (60% equity/40% fixed income) underperformed the MSCI ACWI Index by 3%, and it roared back with a 6% return in the fourth quarter, coming out ahead for the year. Considering last year’s asset class performance in a historical context, 2018 was the worst year since 2008 for an equally weighted diversified portfolio, and it was only one of four years in which this portfolio was negative. A diffusion index is a tool to help measure the levels of concentration (or lack of diversification) in the market. It looks at diversification in four areas: stocks, sectors, countries and assets. A score closer to 1 indicates a more diversified market where most of the securities or assets are doing better than the index. A score closer to -1 suggests that a concentrated number of securities or assets are driving market performance. The diffusion index score shot up from -0.5 as of September 30 to -0.1 as of December 31. This demonstrated that returns came from more diversified sources. 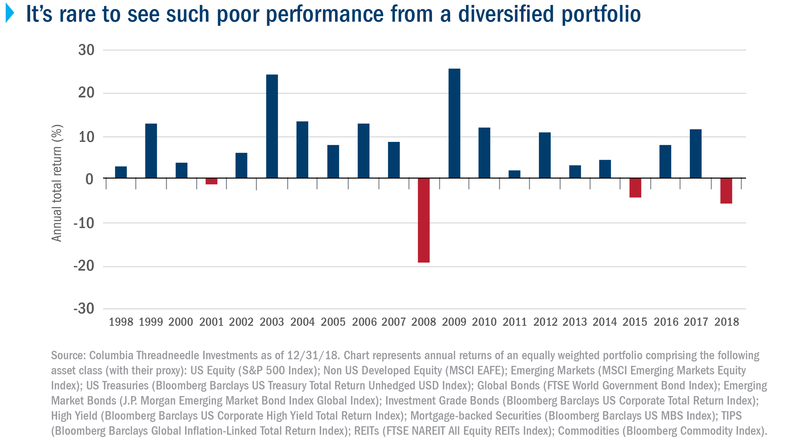 We strongly believe that diversified investors will be rewarded in 2019, just like they’ve been rewarded after other years of poor performance (e.g., 2002, 2009 and 2016). However, if we consider that 2018 was not as bad as 2008, we also can’t expect 2019 to be as strong as 2009. Volatility is still elevated, and a number of the factors that drove market uncertainty in late 2018 are still at play, including trade discussions, Brexit and U.S. government financial-policy tensions. If recent disappointing earnings calls are portents of the future, then we could continue to see earnings announcements weigh on 2019 equity performance. But we do believe that certain asset classes and geographies are interesting areas for recovery, which is why we think investors should diversify their holdings across as many stocks, sectors, countries and assets as possible. 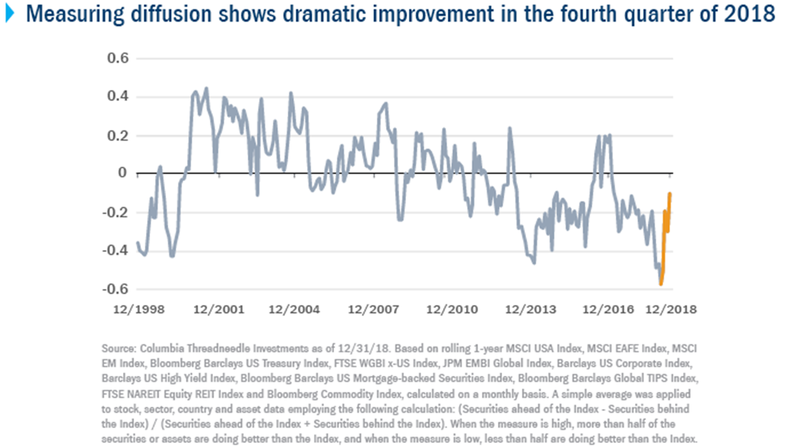 Diversification didn’t work for most of 2018, but it rebounded in the fourth quarter. We expect that trend to continue in 2019. The Bloomberg Barclays U.S. Treasury Index includes public obligations of the U.S. Treasury. The Bloomberg Barclays High Yield Index covers the universe of fixed-rate, non-investment grade debt. The Bloomberg Barclays U.S. Corporate Bond Index is a broad-based benchmark that measures the investment grade, U.S. dollar-denominated, fixed-rate, taxable corporate bond market. The Bloomberg Barclays Global Inflation-Linked Index includes securities which offer the potential for protection against inflation, as their cash flows are linked to an underlying inflation index. The Bloomberg Barclays Global TIPS Index consists of inflation-protection securities issued by the U.S. Treasury. They must have at least 1 year until final maturity and at least $250 million par amount outstanding. The Bloomberg Commodity Index is a broadly diversified index that allows investors to track commodity futures through a single simple measure. The Bloomberg Barclays Mortgage-backed Securities Index is a market-value-weighted index which covers the mortgage-backed securities component of the Bloomberg Barclays U.S. Aggregate Bond Index. The Bloomberg Barclays U.S. Aggregate Bond Index is a market value-weighted index that tracks the daily price, coupon, pay-downs, and total return performance of fixed-rate, publicly placed, dollar-denominated, and non-convertible investment grade debt issues with at least $250 million par amount outstanding and with at least one year to final maturity. The FTSE/NAREIT Index is an index that reflects performance of all publicly traded equity REITs. The FTSE 3-Month Treasury Bill Index is an unmanaged index that tracks short-term U.S. government debt instruments. The FTSE World Government Bond Index (WGBI) is an index of bonds issued by governments in the U.S., Europe and Asia. The J.P. Morgan EMBI Global Index tracks returns for actively traded external debt instruments in emerging markets. The MSCI All Country World Index is a free-float-adjusted market capitalization index that is designed to measure equity market performance in the global developed and emerging markets. The MSCI USA Index is designed to measure the performance of the large- and mid-cap segments of the U.S. market. The MSCI EAFE Index captures large- and mid-cap representation across 21 developed-market countries around the world, excluding the U.S. and Canada. The MSCI Emerging Markets Index captures large- and mid-cap representation across 24 emerging-market countries. The S&P 500 Index is a market-capitalization-weighted index of the 500 largest U.S. publicly traded companies by market value. Indexes are unmanaged and not available for direct investment.